There haven’t been a lot of good news for Litecoin (LTC) lately with ASIC manufacturers cancelling the development of new mining hardware and the exchange rate going down, hitting even below $2 USD briefly today. But LTC is still one of the most popular alternative crypto coins and will most likely continue to be, even though some people think it is doomed. The situation with Bitcoin is not that great lately either, especially with the exchange rate also down like is the case with Litecoin, but we expect things to slowly start recovering in 2015. There is a change for Litecoin that is going to come in a few days – permanent lock of the v2 block type at block 710000 – something that should happen around 9th of January and you need to make sure that you have the latest wallet installed. 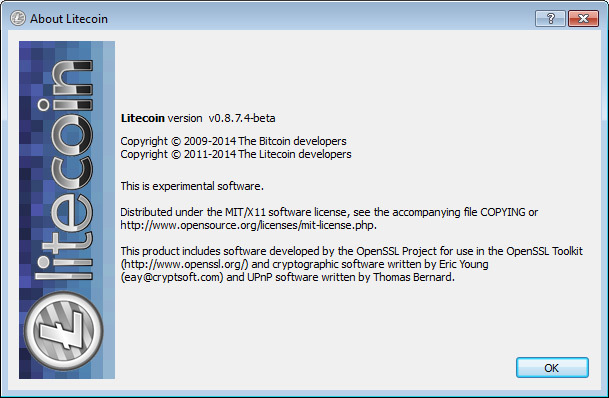 The Litecoin v0.8.7.4-beta has been available for a few months, but still a lot of people might not have updated to that version and you need to make sure you are using it to avoid having issues with the LTC in a few days. Don’t wait for the last day if you still haven’t updated, although it is more important that pool operators update their wallets if they have not done so yet. Later this year we are also going to see the first blow reward halving for Litecoin that is expected to happen at block 840000 that should be reached at around August-September time.